For more details on the workflow and theory underpinning naniar, read the vignette Getting started with naniar. For a short primer on the data visualisation available in naniar, read the vignette Gallery of Missing Data Visualisations. 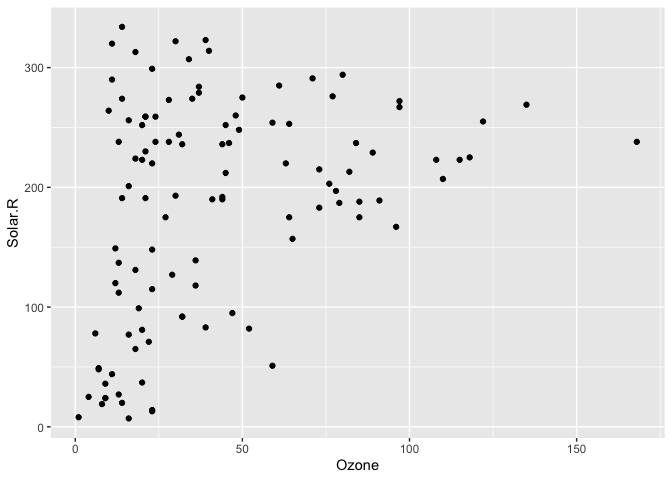 which we illustrate by exploring the relationship between Ozone and Solar radiation from the airquality dataset. #> Warning: Removed 42 rows containing missing values (geom_point). 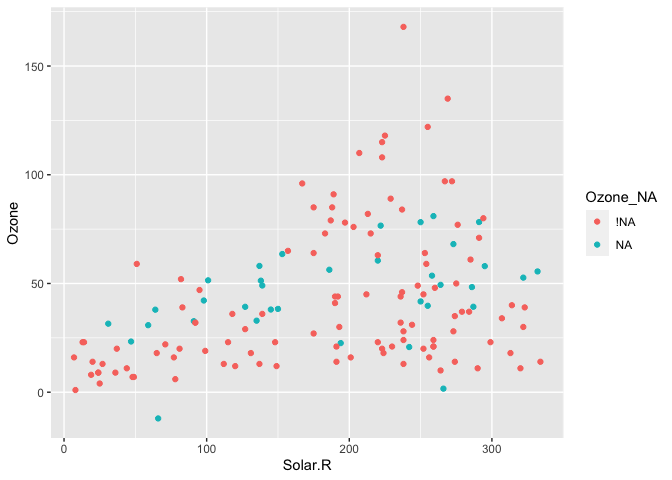 ggplot2 does not handle these missing values, and we get a warning message about the missing values. geom_miss_point() has shifted the missing values to now be 10% below the minimum value. The missing values are a different colour so that missingness becomes pre-attentive. 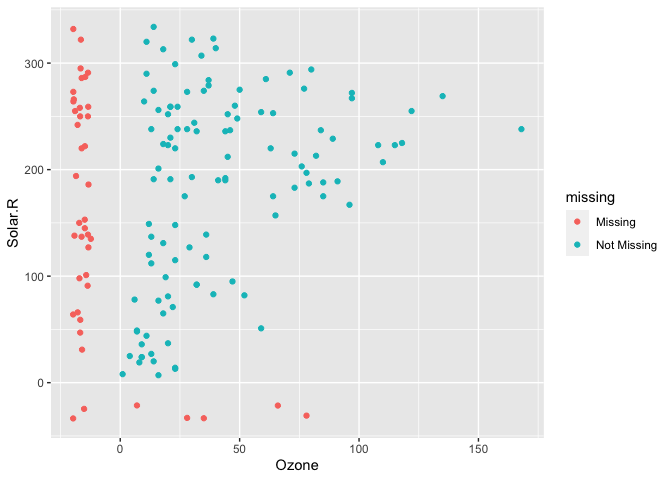 As it is a ggplot2 geom, it supports features like faceting and other ggplot features. naniar provides a data structure for working with missing data, the shadow matrix (Swayne and Buja, 1998). The shadow matrix is the same dimension as the data, and consists of binary indicators of missingness of data values, where missing is represented as “NA”, and not missing is represented as “!NA”, and variable names are kep the same, with the added suffix “_NA" to the variables. #> Warning: Removed 7 rows containing missing values (geom_point). naniar does this while following consistent principles that are easy to read, thanks to the tools of the tidyverse. You can read about all of the visualisations in naniar in the vignette Gallery of missing data visualisations using naniar. naniar provides numerical summaries of missing data, that follow a consistent rule that uses a syntax begining with miss_. Summaries focussing on variables or a single selected variable, start with miss_var_, and summaries for cases (the initial collected row order of the data), they start with miss_case_. All of these functions that return dataframes also work with dplyr’s group_by(). 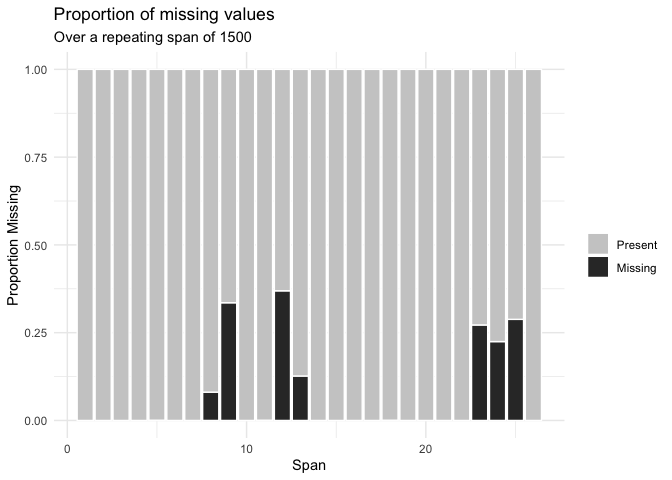 For example, we can look at the number and percent of missings in each case and variable with miss_var_summary(), and miss_case_summary(), which both return output ordered by the number of missing values. You could also group_by() to work out the number of missings in each variable across the levels within it. You can read more about all of these functions in the vignette “Getting Started with naniar”. Firstly, thanks to Di Cook for giving the initial inspiration for the package and laying down the rich theory and literature that the work in naniar is built upon. Naming credit (once again!) goes to Miles McBain. Among various other things, Miles also worked out how to overload the missing data and make it work as a geom. Thanks also to Colin Fay for helping me understand tidy evaluation and for features such as replace_to_na, miss_*_cumsum, and more. 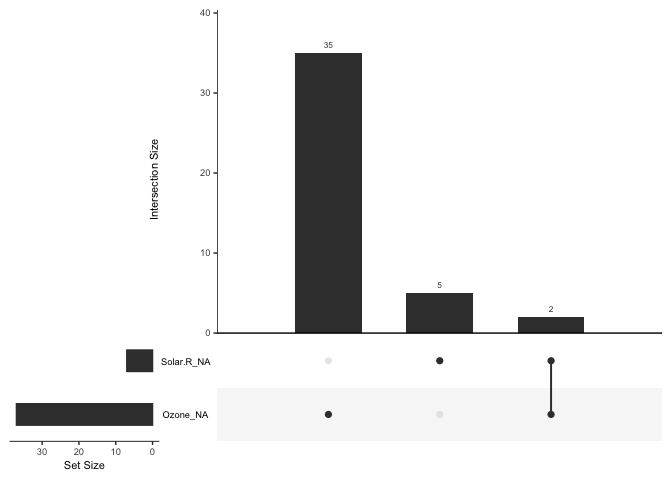 naniar was previously named ggmissing and initially provided a ggplot geom and some other visualisations. ggmissing was changed to naniar to reflect the fact that this package is going to be bigger in scope, and is not just related to ggplot2. 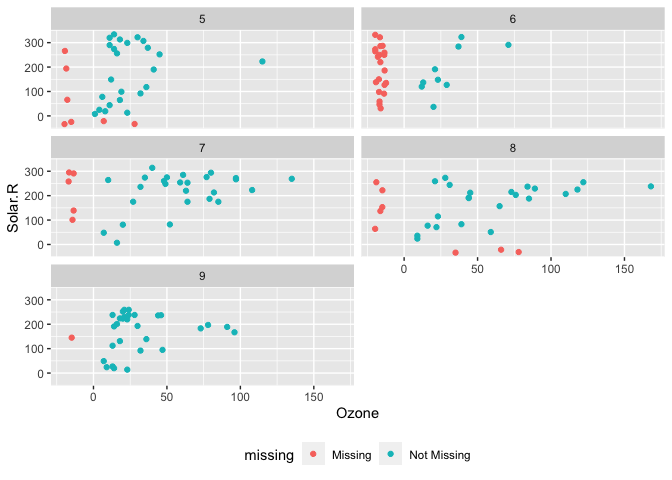 Specifically, the package is designed to provide a suite of tools for generating visualisations of missing values and imputations, manipulate, and summarise missing data. Well, I think it is useful to think of missing values in data being like this other dimension, perhaps like C.S. Lewis’s Narnia - a different world, hidden away. You go inside, and sometimes it seems like you’ve spent no time in there but time has passed very quickly, or the opposite. Also, NAniar = na in r, and if you so desire, naniar may sound like “noneoya” in an nz/aussie accent. Full credit to @MilesMcbain for the name, and @Hadley for the rearranged spelling. The geom_miss_point() ggplot2 layer can now be converted into an interactive web-based version by the ggplotly() function in the plotly package. In order for this to work, naniar now exports the geom2trace.GeomMissPoint() function (users should never need to call geom2trace.GeomMissPoint() directly -- ggplotly() calls it for you). n() must be imported or prefixed like any other function. In the PR, I've changed 1:n() to dplyr::row_number() as naniar seems to prefix all dplyr functions. update_shadow was only restoring the class attributes, changed so that it restores all attributes, this was causing problems when data was a grouped_df. This likely was a problem before too, but dplyr 0.8.0 is stricter about what is a grouped data frame. naniar 0.4.1 (2018/11/20) "Aslan's Song"
Fixes to new_tibble #220 - Thanks to Kirill Müller. Refactoring the capture of arguments from rlang #218 - thanks for Lionel Henry. naniar 0.4.0 (2018/09/10) "An Unexpected Meeting"
nabular() an alias for bind_shadow() to tie the nabular term into the work. is_nabular() checks if input is nabular. geom_miss_point() now gains the arguments from shadow_shift()/impute_below() for altering the amount of jitter and proportion below (prop_below). Added two new vignettes, "Exploring Imputed Values", and "Special Missing Values"
recode_shadow now works! This function allows you to recode your missing values into special missing values. These special missing values are stored in the shadow part of the dataframe, which ends in _NA. implemented shade where appropriate throughout naniar, and also added verifiers, is_shade, are_shade, which_are_shade, and removed which_are_shadow. as_shadow and bind_shadow now return data of class shadow. This will feed into recode_shadow methods for flexibly adding new types of missing data. Note that in the future shadow might be changed to nabble or something similar. Functions add_label_shadow() and add_label_missings() gain arguments so you can only label according to the missingness / shadowy-ness of given variables. new function which_are_shadow(), to tell you which values are shadows. gg_miss_upset gets a better default presentation by ordering by the largest intersections, and also an improved error message when data with only 1 or no variables have missing values. shadow_shift gains a more informative error message when it doesn't know the class. Changed common_na_string to include escape characters for "? ", "", "." so that if they are used in replacement or searching functions they don't return the wildcard results from the characters "? ", "", and ".". miss_case_table and miss_var_table now has final column names pct_vars, and pct_cases instead of pct_miss - fixes #178. These old names will be made defunct in 0.5.0, and removed completely in 0.6.0. Ensured that miss_scan_count actually return'd something. naniar 0.3.1 (2018/06/10) "Strawberry's Adventure"
naniar 0.3.0 (2018/06/06) "Digory and his Uncle Are Both in Trouble"
impute_below Perfoms as for shadow_shift, but performs on all columns. This means that it imputes missing values 10% below the range of the data (powered by shadow_shift), to facilitate graphical exloration of the data. Closes #145 There are also scoped variants that work for specific named columns: impute_below_at, and for columns that satisfy some predicate function: impute_below_if. impute_mean, imputes the mean value, and scoped variants impute_mean_at, and impute_mean_if. impute_below and shadow_shift gain arguments prop_below and jitter to control the degree of shift, and also the extent of jitter. Added unbind_shadow and unbind_data as helpers to remove shadow columns from data, and data from shadows, respectively. Added is_shadow and are_shadow to determine if something contains a shadow column. simimlar to rlang::is_na and rland::are_na, is_shadow this returns a logical vector of length 1, and are_shadow returns a logical vector of length of the number of names of a data.frame. This might be revisited at a later point (see any_shade in add_label_shadow). Aesthetics now map as expected in geom_miss_point(). This means you can write things like geom_miss_point(aes(colour = Month)) and it works appropriately. Fixed by Luke Smith in Pull request #144, fixing #137. Default presentation is with order_cases = TRUE. gg_miss_fct uses a minimal theme and tilts the axis labels #118.
imported is_na and are_na from rlang. Added common_na_strings, a list of common NA values #168. Added some detail on alternative methods for replacing with NA in the vignette "replacing values with NA". Speed improvements. Thanks to the help, contributions, and discussion with Romain François and Jim Hester, naniar now has greatly improved speed for calculating the missingness in each row. These speedups should continue to improve in future releases. Updated the vignette "Gallery of Missing Data Visualisations" to include the facet features and order_cases. bind_shadow gains a only_miss argument. When set to FALSE (the default) it will bind a dataframe with all of the variables duplicated with their shadow. Setting this to TRUE will bind variables only those variables that contain missing values. Cleaned up the visualisation of gg_miss_case to be clearer and less cluttered ( #117), also added n order_cases option to order by cases. Added a facet argument to gg_miss_var, gg_miss_case, and gg_miss_span. 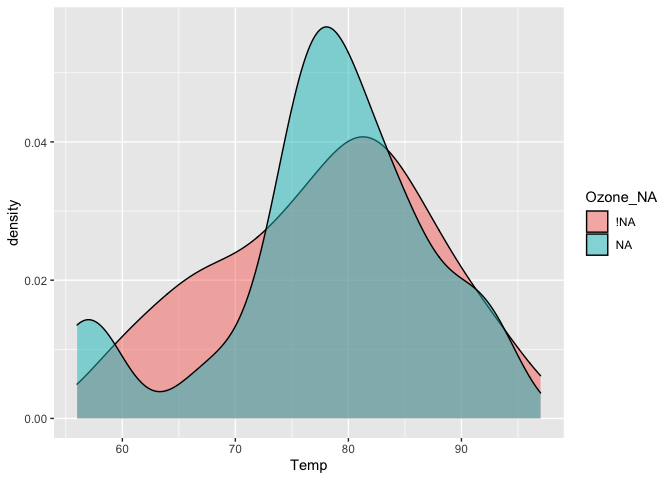 This makes it easier for users to visualise these plots across the values of another variable. In the future I will consider adding facet to the other shorthand plotting function, but at the moment these seemed to be the ones that would benefit the most from this feature. Deprecated replace_to_na, with replace_with_na, as it is a more natural phrase ("replace coffee to tea" vs "replace coffee with tea"). This will be made defunct in the next version. cast_shadow no longer works when called as cast_shadow(data). This action used to return all variables, and then shadow variables for the variables that only contained missing values. This was inconsistent with the use of cast_shadow(data, var1, var2). A new option has been added to bind_shadow that controls this - discussed below. See more details at issue 65. Change behaviour of cast_shadow so that the default option is to return only the variables that contain missings. This is different to bind_shadow, which binds a complete shadow matrix to the dataframe. A way to think about this is that the shadow is only cast on variables that contain missing values, whereas a bind is binding a complete shadow to the data. This may change in the future to be the default option for bind_shadow. Update vignettes to have floating menu and better figure size. minor changes to graphics in gg_miss_fct - change legend title from "Percent Missing" to "% Miss". naniar 0.1.0 (2017/08/09) "The Founding of naniar"
Reviewed documentation for all functions and improved wording, grammar, and style. added a new vignette "naniar-visualisation", to give a quick overview of the visualisations provided with naniar. removed miss_df_pct - this was literally the same as pct_miss or prop_miss. miss_var_summary & miss_case_summary now have consistent output (one was ordered by n_missing, not the other). replace_to_na is a complement to tidyr::replace_na and replaces a specified value from a variable to NA. gg_miss_fct returns a heatmap of the number of missings per variable for each level of a factor. This feature was very kindly contributed by Colin Fay. gg_miss_ functions now return a ggplot object, which behave as such. gg_miss_ basic themes can be overriden with ggplot functions. This fix was very kindly contributed by Colin Fay. got the svgs generated from vdiffr, thanks @karawoo! changed geom_missing_point() to geom_miss_point(), to keep consistent with the rest of the functions in naniar. ts generic functions are now miss_var_span and miss_var_run, and gg_miss_span and work on data.frame's, as opposed to just ts objects. Removed old functions miss_cat, shadow_df and shadow_cat, as they are no longer needed, and have been superceded by label_missing_2d, as_shadow, and is_na. drastically reduced the size of the pedestrian dataset, consider 4 sensor locations, just for 2016.
renamed package from naniar to narnia - I had to explain the spelling a few times when I was introducing the package and I realised that I should change the name. Fortunately it isn't on CRAN yet. Added prop_miss and the complement prop_complete. 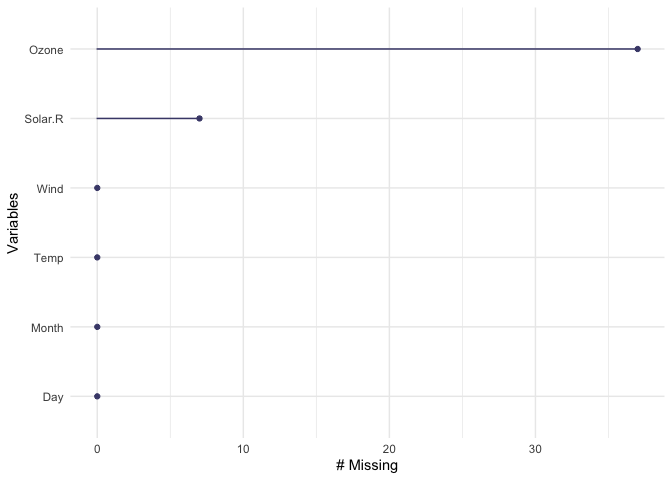 Where n_miss returns the number of missing values, prop_miss returns the proportion of missing values. Likewise, prop_complete returns the proportion of complete values. As stated in 0.0.5.9000, to address Issue #38, I am moving towards the format miss_type_value/fun, because it makes more sense to me when tabbing through functions. To address Issue #38, I am moving towards the format miss_type_value/fun, because it makes more sense to me when tabbing through functions. This is more consistent and easier to reason with. These will be made defunct in the next release, 0.0.6.9000 ("The Wood Between Worlds"). n_complete is a complement to n_miss, and counts the number of complete values in a vector, matrix, or dataframe. shadow_shift now handles cases where there is only 1 complete value in a vector. added much more comprehensive testing with testthat. geom_missing_point() broke after the new release of ggplot2 2.2.0, but this is now fixed by ensuring that it inherits from GeomPoint, rather than just a new Geom. Thanks to Mitchell O'hara-Wild for his help with this. missing data summaries table_missing_var and table_missing_case also now return more sensible numbers and variable names. It is possible these function names will change in the future, as these are kind of verbose. semantic versioning was incorrectly entered in the DESCRIPTION file as 0.2.9000, so I changed it to 0.0.2.9000, and then to 0.0.3.9000 now to indicate the new changes, hopefully this won't come back to bite me later. I think I accidentally did this with visdat at some point as well. Live and learn. gathered related functions into single R files rather than leaving them in their own. correctly imported the %>% operator from magrittr, and removed a lot of chaff around @importFrom - really don't need to use @importFrom that often. geom_missing_point() now works in a way that we expect! Thanks to Miles McBain for working out how to get this to work. percent_missing_case the percentage of cases that contain missing values. gg_missing_which: plot which columns contain missing data.